CEFISA has the equipments and experience at its disposition in order to be able to develop projects using GPRS-UMTS technology for remote supervision of installations. This technology can be applied to the reception of data from remote stations over a wide geographical area, as well as serving to undertake supervision of installations from mobile locations utilizing PDA mobile telephones or portable computers equipped with GPRS-UMTS modems. Since year 2000, CEFISA has been implementing telemetry systems based upon mobile phones for sectors such as: environment, telecom, water management, etc. Remote Control of regional or municipal lighting centers. Control & monitoring of water wells, and pumping stations. Monitoring of unmanned stations, such as emergency power. Regional, and national distributed telemetry systems. Monitoring of remote machines to save on maintenance costs. Industry of water & energy management. The aim of the systemisto monitor, control and teleoperate the electrical management of plants located in remote places. The only transmission way, in this special case, is through mobile telephony. 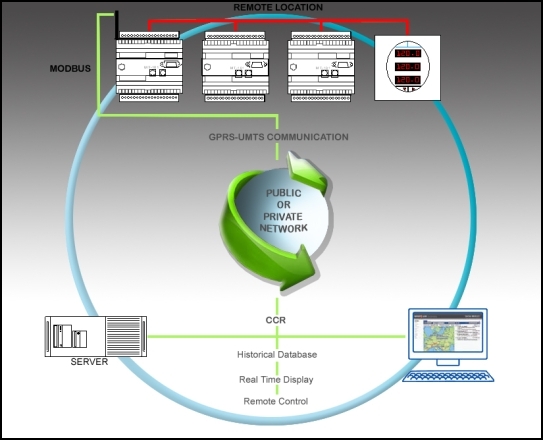 There is a server with a historical and real time data base of all places under control as well as with a HMI interface. The operator can check the real time status of any selected place, the historical trend of several parameters and even can execute the remote control. The control centre is based upon GEFanuc open technologies, such as iFix, Historian, OPC…, which are so easily integrated from a business point of view. This application controls the access to remote locations. A matrix keyboard is used as the access system. The user introduces an access code which previously has been sent to the location under control. If the access code is valid the door will be opened. The system can also check the access time in order to generate any potential alarm in case of the personnel way out doesn’t match in a specific time (Labour Safety). It may also be used against intrusive people.